Papillon names are often derived from the appearance of their ears, which are thought to look like the wings of a butterfly. Monarch, Lady, Copper, and Skipper are a few names borrowed from butterflies. Other top Papillon names related to wings include Dove and Angel. Over recent years it has become increasingly popular to name a dog after a designer brand. 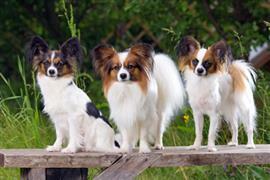 Chanel, Chloe, and Milly are among the most common designer names for a female Papillon. Armani, Coach, and Abercrombie are typical picks for a male. The breed originated in Europe and was very popular in France. In fact, Papillon actually comes from a French word meaning moth. Adele, Sophie, and Noel are French names that are trending among owners. Some of our pages will contain a subcategory. A subcategory is a slightly more specific grouping than the main topic of the page. For a subcategory, we will include a separated table of names and corresponding descriptions. An example of a subcategory of Red Dog Names would be 'Dog Names Inspired by Red Wines'. If you have any subcategory ideas for the Papillon Names page, we would love to hear them. Use the form below to submit your ideas.